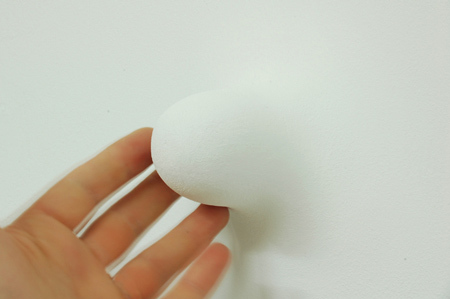 Trigger Point Mouldings by architectural firm Touchy-Feely are special rounded fibrous plaster forms that can be integrated into the surface of an ordinary wall. Heating elements inserted from the other side warm the inviting protrusions to body temperature. As suggestive protrusions, the mouldings encourage heightened, physical interactions between bodies and architectural surfaces, and suggest that buildings can perform, or intimate towards the necessary work of massage therapists. Heating elements inserted into the backs of the plaster protrusions warm the forms to body temperature and assist in muscle tension relief. As warmed wall areas, the protrusions create a gentle threshold between body and building. Massage therapists commonly work to access and manipulate multiple trigger points in the body found in the shoulders, neck, knees, etc as a means of aiding such diverse ailments as nausea, quitting smoking, colds, fatigue, sexual problems, etc. Touchy-Feely worked in consultation with massage therapists to develop forms of an appropriate depth and shape to facilitate self-trigger point massage. The mouldings can be installed easily into any new or existing drywall or plastered wall surface at any desired height or in any density/pattern. This is a somewhat more sensuous use for plastex, the emotionally sensitive wall materials from J.G. Ballard's The Thousand Dreams of Stella Vista. "Lively responses, aren't they, Mr. Talbot?" He put his hand on the wall behind us. The plastex swam and whirled like boiling toothpaste, then extruded itself into a small ledge. Stamers sat down on the lip, which quickly expanded to match the contours of his body, providing back and arm rests. From Dezeen via Posthuman Blues.